A new arrival at Mottl and Tzeitel's! 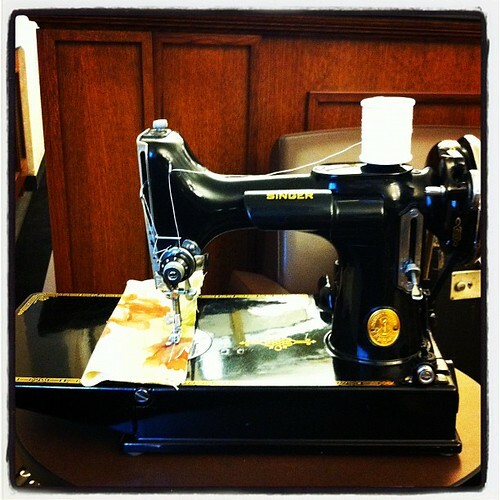 So you won't be surprised when I show you my new arrival - a 1939 Featherweight! She's in prime condition - the gold decals around the edges are intact, hardly any scratches, beautiful scrollwork engraving on the face plate and chrome wheel. The serial number begins with AF, which signals a 1939 date of manufacture. She came in her original case (that doesn't smell, which I gather is a problem with some of them), with bobbins, a handful of feet that look like medieval instruments of torture, the original instruction manual, and a zipper foot attachment with cams and an "automatic zigzagger". I had to take a trip to Toronto for a meeting, and on a whim I checked Toronto Kijiji listings to see if there were any Featherweights on offer. I saw three listed, but this one was the only one I went to see. It was reasonably priced, easily accessible by public transit, and was being sold by a retired lady who was "decluttering" and reported that the machine had been in her family since its purchase. It had clearly been well taken care of. And now she's mine! I am beyond thrilled and very happy to be able to give this little darling a good home!